In the days before I racheted up my felting regime a notch, I had a quiet November, January, and February. I was very busy those months this year and I am now so flat out that friends have started ringing me to see if I am okay they haven't heard from me in so long. Wake, laundry, clean, feed, small boy off to school, two hours of phone calls and emails, and then off to paid work. After that, studio, phone, email, feed, avoid cleaning, stitch, and fall asleep in my chair. Wake up and go to bed at 1:30am and then repeat. 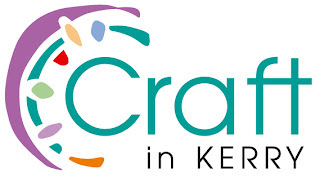 Craft in Kerry is off to an amazing start. Truly, it's time had come. I am having a hard time keeping up with all the opportunities that are coming our way. Our craft fair on April 29th is having some teething problems, but I will figure it out. We are on Radio Kerry for an hour's interview this Wednesday and headed to Dublin April 4th for Meitheal with Failte Ireland to promote the Handmade Sessions, our new craft education venture. We will be teaching 4 hour workshops for visitors and locals alike from 10-1pm and 2-6pm in a variety of crafts, including patchwork, felting, woodworking, embroidery, jewelry, and much more. Accommodating 8-10 people per setting, we will be working towards our goal of providing employment for talented craft workers and preserving handmade traditions. The Handmade Sessions will begin in June and we are hard at work to get all the fine print sorted so we will be ready for the summer season. New piece on the way to the framer.. In the meantime, I have my own felting workshop on April 27th to get ready for. Located in Dingle, it is an excellent beginner's felting class. After getting down to basics on wool materials and how to felt, we will felt a few sample pieces and then I will show how to lay out fibres using a resist to make felted journal covers. I'm looking forward to it! And if that's not enough, the lovely Pam de Groot will be visiting Dingle and teaching a 3 day Master Class in felting and resist dyeing. Pam is Dutch by way of Australia and will be in Europe for a limited time, so we jumped at the opportunity to host her. Day One on Friday, June 17 will be resist dyeing, Day 2 & 3 are mosaic felting of wearables. Day One can be taken by itself or with Day 2/3 or Day 2/3 on their own. The fee is €50 for Day One by itself or €100 for Day 2/3 on their own or €150 for the three days. Pam's work is best seen on her blog http://pamdegroot.blogspot.com/. She mosaic "tiles" in pre-felted pieces to make beautiful wraps and wearable pieces, made even more beautiful by her resist dyed silks. The three days together promise to be wonderful and great value. The price does not include room or board, but I can help people from out of town find a good deal if they need help. Spaces are limited to just 12 people, so please contact me at sharon1_crandall@hotmail.com. In the meantime, I actually got two new pieces done this week. This is a partial shot of the finished panel, awaiting it's journey to the framer. It's a mix of felt, silk, cotton fabric and machine embroidery. The weather has been sunny and dry this week, so I've started dyeing lots of wool and it will really show in these new pieces as the hand-dyed fibres really bling up the designs. Newly framed piece on the way to Killarney! Where have I been? Why so silent? My young son got the chicken pox this week. Not plain old chicken pox, but a rather hard dose so I have been up at the wrong times of the night for the wrong reasons, running soda baths, visiting A&E, rubbing lotion on spots, checking fevers, hugging gently, and silently cursing chicken pox. Thankfully no new spots today, so we are on the way to shoving them out the door, thanks for calling, bye now!! What have I got done this week? Precious little. Hard to feel creative when you are so tired that even coffee isn't appealing. I dropped off my last few pieces to the framer to get ready for Killarney, so they are in my possession and ready to head over. Not as thrilling as I originally envisioned since I just want to get them there and go on to salvaging the train wreck of a week. No time to celebrate as I have so much coming at me next week that if I don't clean my house today then there will be no chance of getting it done for another week. 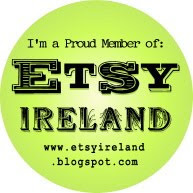 I have been able to do some things by phone and Craft in Kerry is building up to be quite a great group. Fantastic people that I have met so far and so enthusiastic about the work we are doing. The craft fair is all set to go and we are planning a trip to Dublin to promote our summer craft sessions to tour operators. A premises is being looked into and so there will be a flurry of activity to get ready, as Failte Ireland hasn't given a lot of notice. Spring is in the air, but so is change!